Mystery Mine is a roller coaster in Timber Canyon at Dollywood. While it's not the best, it is also recommended. The minimum height to ride is 48 inches. The U.S.'s first roller coaster based on the Gerstlauer's Euro-fighter design, which combines an intimate guest experience with hair-raising 95-degree drops, vertical lifts, and multiple inversions. Located in Dollywood’s Timber Canyon area, Mystery Mine is themed as a long-abandoned coal mine with an eerie past. 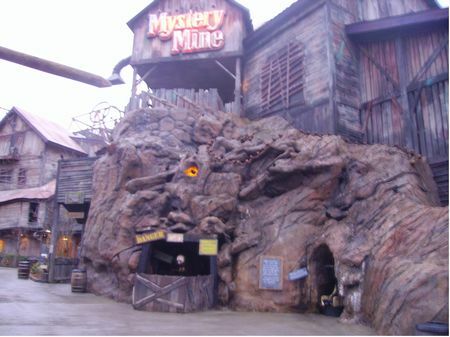 Mystery Mine utilizes a state-of-the-art show experience built on special effects, audio and lots of excitement. Mystery Mine is a worthwhile excursion. While it's a bit of a neck-breaker and its second half is much more thrilling than its first, MM offers plenty of fun surprises and continues to build momentum toward a thrilling finale. It's also a beautifully themed coaster outside and in. It even features its own theme song! One thoughtful touch is the availability of individual lockers whose locks synchronize with the arrival and departure of your train.